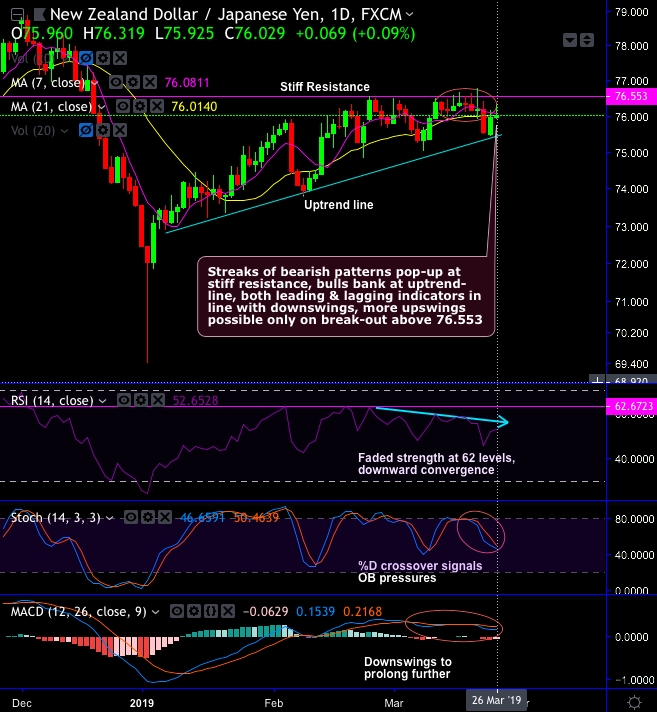 NZDJPY forms flurry of bearish patterns at the stiff resistance of 76.553 levels, while bulls bank at uptrend-line. Back-to-back shooting stars and gravestone doji are occurred to signal weakness of this pair (refer circular area on daily chart). While both leading and lagging indicators are in line with downswings that indicates intensified selling momentum, more upswings possible only on break-out above 76.553 levels. The major downtrend slides through the falling wedge, Bearish engulfing nudges below EMAs, bulls attempt to bounce-back on hammer but restrained below 21-EMAs & wedge resistance (refer monthly chart). On a broader perspective, contrary to the above standpoint, bearish engulfing has occurred at 73.545 levels that intensifies major downtrend below EMAs, while bulls attempt to bounce-back on hammer formation at 75.271 levels but restrained below 21-EMAs. For now, more slumps on cards as both lagging indicators signal bearish trend continuation & RSI indicated faded strength. Hence, ahead of RBNZ’s monetary policy (that is likely to maintain status quo in its OCR rates), we advocate maintaining shorts in mid-month futures with a view of arresting downside risks. Alternatively, one can also buy boundary strikes options with upper strikes at 76.553 and lower strikes at 75.524 levels on intraday trading grounds. Currency Strength Index: FxWirePro's hourly NZD spot index is inching towards 108 levels (which is bullish), JPY at 138 (bullish), while articulating (at 05:28 GMT).